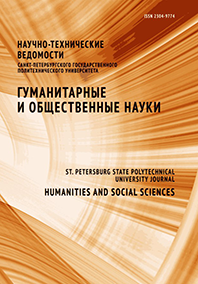 Olga D. Shipunova Evseev Vladimir V.
The paper is dedicated to the 120th anniversary of the St. Petersburg Polytechnic University, includes a brief history of the Institute of Humanities and biographical information. Mikhail Alekseevich Vasilik (1935–2005) was a Soviet and Russian philosopher, political scientist. He was awarded the degree of Doctor of Philosophy in 1971, was a professor, full member of three academies, Honored Worker of the Higher School of the Russian Federation, holder of the Order of the Badge of Honor, Dean of the Faculty of Humanities, head of the Political Science Department of SPbSPU in 1990–2005.